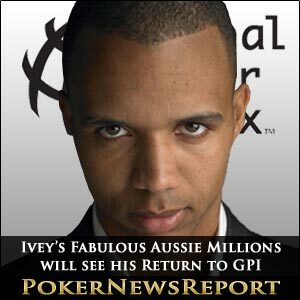 American poker superstar Phil Ivey looks destined to enjoy a double celebration over the next few days as his 36th birthday on Wednesday should also see his imminent return to the Global Poker Index (GPI) 300 after four months in the wilderness. The Californian already has much to celebrate with his spectacular start to 2012 after enjoying a highly profitable Aussie Millions – his first major event since November’s Asia Pacific Poker Tour (APPT) Macau – in Melbourne, where he took the top prize of $2,058,948 for winning the AUD$250,000 buy-in Super High Roller not long after being knocked out in 12th place during the AUD$10,000 buy-in main event for $102,947. The former Team Full Tilt Poker Pro was thrilled “to be playing poker” once more after he decided to take “time off” – which is most likely a reference to his well known troubles with the beleaguered poker room. However, he also spoke of his decision to come “back to Macau” for his return to poker, which got him playing again, before landing “one of my first tournament back”, the Super High Roller at the Australian city’s Crown Casino. Phil Ivey was – although happy – cool about his comeback victory after a barren 2011, adding that “it’s nice to get back to winning”. Incredibly, Ivey followed his exit at the hands of Canadian Yann Dion on Day 5 of the main event to then take down the Super High Roller when he defeated Finnish star Patrik Antonius in their heads-up clash. Ivey started the head-to-head just ahead of the 31-year-old Finn, but had managed to take a 7 to 1 chip lead when Antonius pushed all-in while holding K♠ 3♦ – just 11 hours after the tournament had kicked off. On the button, Ivey called with A♥ Q♦ to dominate the former tennis pro, but found himself behind after a flop of 6♠ 5♠ 3♣ appeared gave Antonius two threes. However, Ivey moved in front when the Q♣ landed on the turn to give him top pair. The 8♦ on the river changed nothing – and Ivey was champion. Antonius collected $1,235,369 for his runner-up spot, while dynamic Dane Gus Hansen left with $823,579 for third. Ivey did not manage a single tournament cash all last year – even though he did admittedly chop down his schedule for 2011 – and boycotted the World Series of Poker (WSOP) in Las Vegas last summer in support of angry Full Tilt customers, who have still not been allowed access to funds in their accounts with the poker room. Of course, this cash problem emerged after the US Department of Justice (DoJ) closed down several poker rooms – including Full Tilt, PokerStars and Absolute Poker – on Black Friday last April 15 on charges of illegal gambling, money laundering and bank fraud. So, with Full Tilt’s American players having obviously not been paid as the 42nd staging of the poker world’s biggest event approached on the horizon, the eight-time WSOP bracelet winner took the decision on May 31 – the day of the first WSOP event at the Rio All-Suite Hotel & Casino – to announce his boycott on his official Facebook page. The 35-year-old – who is rumoured to be playing under the moniker ‘RaiseOnce’ at PokerStars – took to the microblogging website to write that he reckoned it was only right for him to stay away from Vegas “as I do not believe it is fair that I compete when others cannot”. His lack of appearances and therefore the ability to cash diminished, resulting in Ivey dropping off the GPI 300 last September. But he should zoom back on to the charts in the wake of his Melbourne visit, although it’s almost guaranteed he won’t be able to match Jonathan Duhamel’s incredible recent rise that has seen the French-Canadian break into the GPI’s top 10. The 24-year-old Duhamel leapt 41 places the previous week, but – in what was a pretty uneventful week as far as the top of the GPI rankings went – Duhamel made a notable move by replacing fellow Canadian Mike ‘Timex’ McDonald in the number 10 spot. Duhamel overtook McDonald even though his points total remained the same on 2,377.58. However, McDonald lost 69.27 to now sit on 2337.53 in 11th spot. The 2010 World Series of Poker (WSOP) main event champion’s rise up the GPI 300 continued, of course, as his outstanding performances at the recent PokerStars Caribbean Adventure (PCA) were counted in Period 1. The Team PokerStars Pro took fourth spot in the PCA’s $100,000 buy-in No-Limit Hold’em Super High Roller event for $313,600 on January 5, while he added three more final table appearances – a second in the $25,000 No-Limit Hold’em Eight-Max High Roller for $634,550, a fifth in the $5,000 No-Limit Hold’em Eight-Max Turbo for $17,990 and first in the $5,000 No-Limit Hold’em Eight-Max for $239,830 – to see him add over $1.2 million to his live tournament earnings. Duhamel’s good fortune had to leave someone disappointed, however, and that man was Ontario’s McDonald, whose third place at the 2010 European Poker Tour (EPT) Deauville main event for a pay day of $417,610 dropped into Period 5 for his one spot fall. The top six places on the GPI remain unchanged, with eight-time WSOP bracelet winner Erik Seidel retaining his top spot just ahead of fellow American Jason Mercier. New Yorker Seidel enjoyed a magnificent set of results at last year’s PCA – with fourth at the $25,000 buy-in No-Limit Hold’em High Roller event for $295,960 after picking up $46,560 a few days earlier for his third-place finish in the $5,000 buy-in No-Limit Hold’em Six-Max event on Paradise Island – to enhance his previously empty Period 3 to take over at the top last week, and stayed there on 3,053.44 after increasing his points score by 65.15. The Las Vegas-based pro was just 2.22 points ahead of Team PokerStars Pro Mercier in the previous rankings, but increased that to 67.37 over the Hollywood-based star, who stayed at 2,986.07 points. French Team PokerStars Pro Bertrand ‘ElkY’ Grospellier – who is one of just three players to capture the Triple Crown – stayed third on 2,819.53 (a small drop of just 4.17), while Ukrainian Eugene Katchalov (2,760.52) and Canadian Shawn Buchanan (2,672.49) also showed no movement or points change to remain in fourth and fifth respectively. Englishman Sam Trickett – who just last week picked up the Player of the Year at the 2012 European Poker Awards – has held on to his sixth place on the GPI 300. However, the Titan Poker-sponsored pro from Nottinghamshire – who won the Partouche Poker Tour (PPT) main event in Cannes back in November for €1 million – dropped a huge 146.25 points to now sit on 2,436.22, which is just 13 points ahead of seventh-placed Will ‘The Thrill’ Failla, who has 2,423.22. The 2011 Legends of Poker champion from New York State did, however, move up one spot, as did Brooklyn’s Vanessa Selbst – yet another Team PokerStars Pro – after they leapfrogged Florida’s Matt Waxman. Team PokerStars Pro Selbst might have stayed on 2,412.31 points, but overtook fellow American Waxman after he dropped 29.65 and two places to sit on 2,400.18. 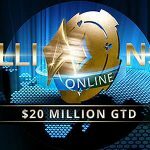 While there was no movement in the top six, we could well witness a new leader come the following charts release as the Aussie Millions Super High Roller from last January plays its part. Of course, we know Ivey is sure to make an impact on the rankings, but Seidel’s win from last year will now fall into Period 3 of the next release, which could allow Mercier – who took ninth place in this year’s Super High Roller – to take over the GPI top spot once more. Seidel – with 11th place in this year’s event – beat Trickett in their heads-up battle in 2011, and that ageing result could also see the Englishman fall behind Failla in seventh place and maybe even below Selbst into eighth. Meanwhile, former Team PokerStars Pro Joe Hachem led a small band of just four players to return to the GPI 300. The Lebanese-Australian pro – who is best known for winning the 2005 WSOP main event – entered the charts in 177th place on 1,250.97 points after picking up $339,726 for his third place in the recent Aussie Millions $100,000 Challenge. The other three to break into the top 300 are Nicolas Cardyn (230th on 1,161.08), Martin Finger (299th on 1,047.39) and Stefan Huber (300th on 1,047.28). However, that meant disappointment for Taylor von Kriegenbergh, Ray Qartomy, Mike Sowers as all four dropped out of the rankings. The Aussie Millions $100,000 Challenge also played a huge part in seeing American Dan Smith leap 90 places to 65th on 1,677.31 points. The Las Vegas-based pro picked up $1,041,828 for his victory from a 22-player field, but will also have been pleased to see his GPI listing improve. California’s Adam Levy – who took 12th place at last summer’s WSOP main event – led the nine other big movers by climbing 33 spots to 259th on 1,113.51 points, and was followed by Byron Kaverman (up 30 to 55th on 1,726.08), Benjamin Pollak (up 29 to 89th on 1,551,71), Joe Tehan (up 22 to 44th on 1,805.96), Erich Kollmann (up 18 to 129th on 1,408.18), Simon Charette (up 17 to 248th on 1,136.56), Amir Lehavot (up 17 to 83rd on 1,588.24), Tristan Wade (up 13 to 91st on 1,540.98) and Stephane Benadiba (up 10 to 209th on 1,202.67). On the flipside, Canadian Team 888poker Pro Tyler Bonkowski – who had dropped 12 spots on the previous week’s list – had to endure the biggest fall when he lost 71 places and 121.86 points to sit at 245th on 1,140.91 as the Regina native’s 14th place from last year’s Aussie Millions main event fell into Period 3 and his 49th from the 2010 main event dropped into Period 5. The one-time WSOP bracelet winner – from his $220,817 success for landing event #14, a $3,000 buy-in Limit Hold’em tournament, in Vegas last summer – was joined by nine other notable losers. They are Sacramento’s Randy Lew (down 59 places to 211th on 1,196.18), Adam Geyer (down 41 to 165th on 1,276.41), Lee Markholt (down 37 to 227th on 1,166.33), David Steicke (down 37 to 125th on 1,425.60), Matt Stout (down 31 to 184th on 1,241.00), Hafiz Khan (down 30 to 103rd on 1,504.15), Tom Marchese (down 30 to 74th on 1,637.56), Guillaume Darcourt (down 29 to 267th on 1,102.23) and Joe Elpayaa (down 25 to 249th on 1,134.88).